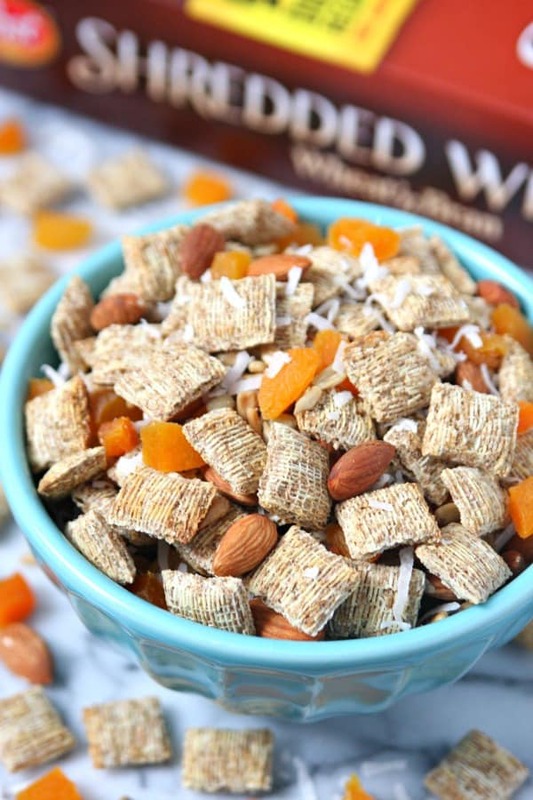 I’m sharing my new obsession with you all today – Breakfast Trail Mix. It’s perfect for busy mornings. I love it because I’m not always hungry in the morning. I first need my morning coffee before I can eat anything. I can mix up a batch of this trail mix for the week and then I have it to snack on in the morning when I do get hungry. It’s the perfect breakfast for all of us as we’re rushing out the door in the morning. Connor can take it for lunch since he eats at 10:00 and hubby can eat it on his way to work in the car. I can grab it on my way out the door or I can munch on it while I’m working from home. It really is the perfect breakfast for the entire family. Wondering what to include in your homemade trail mix? Nuts – Start with your favorite nuts because they’re loaded with healthy unsaturated fats, protein, fiber, antioxidents, and other essential vitamins. I usually add almonds, walnuts or cashews. Seeds – Add a handful of seeds to your trail mix for an extra boost of nutrients. I like to add sunflower seeds but you could add pumpkin, sesame, and flax seed. This is also great for people who have nut allergies. Whole Grain – Add whole grains to your mix for extra fiber. 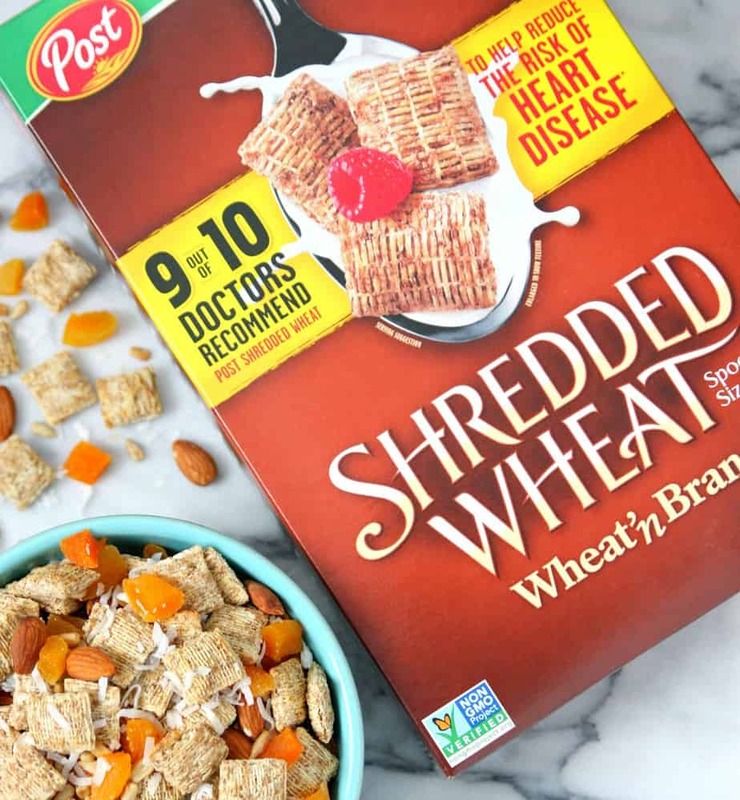 Post® Shredded Wheat is the perfect addition to this trail mix because its loaded with fiber without the added sugar – It’s packed with 49 grams of whole grain and 6 grams of fiber to be exact. Dried Fruit – Add a dried fruit that will also provide fiber, antioxidents, and vitamins. I always go with dried apricots because I love them and they have more vitamins than other dried fruits. Something Sweet – Finally, add something sweet. This can be a chocolate chips, yogurt covered raisins or M&M’s. I added coconut flakes to my trail mix to sweeten it up a little. The combination of the apricots and coconut is sweet enough for me. Remember, keep things simple when making your homemade trail mix. It doesn’t have to be complicated and you don’t even need to measure things out. Just dump and mix. 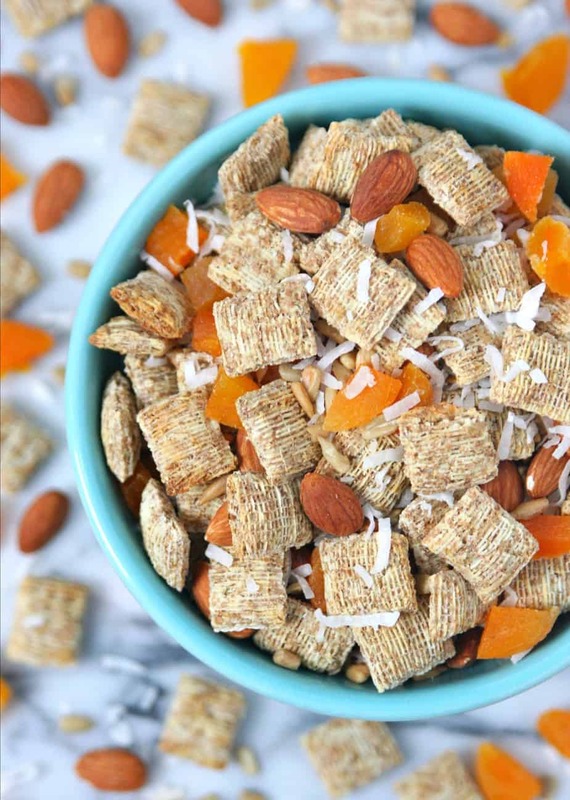 Make your breakfast better with Post® cereals! Remember, breakfast IS the most important meal of the day and thanks to Post® it’s never been easier to prepare a healthy and tasty breakfast. Post® cereals contain fiber that prepares your body for the day and keeps you full until lunch. And they have whole grains and nutrients, including protein, fiber, B vitamins and antioxidants. Print out Post® coupons HERE so you can make this Breakfast Trail Mix and stock up on all your favorite cereal. 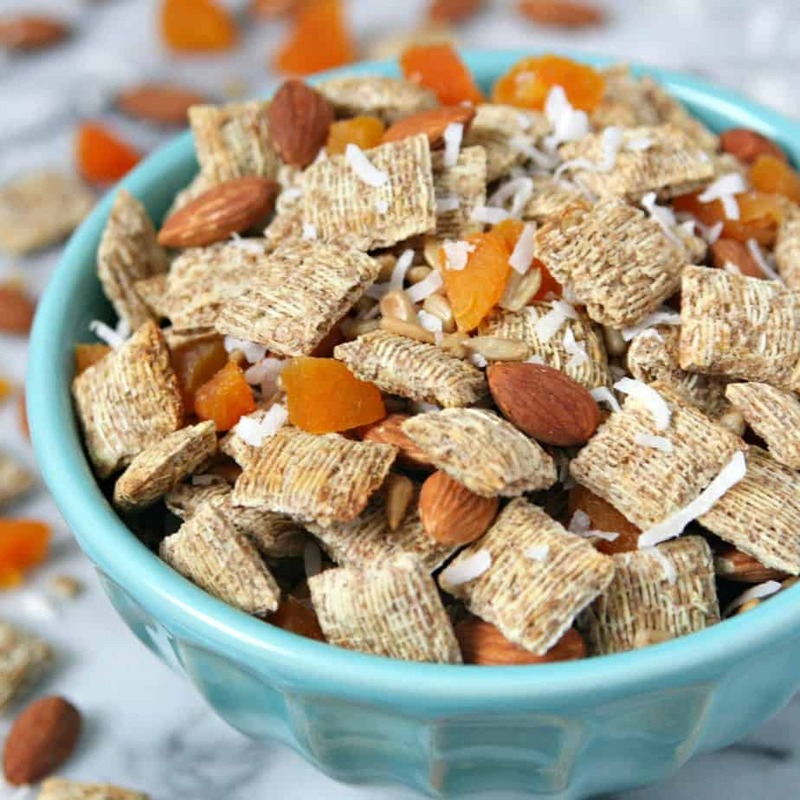 Now this is my idea of the perfect Breakfast Trail Mix – Post® Shredded Wheat, almonds, sunflower seeds, dried apricots, and shredded coconut. Mix all ingredients in large bowl. Store in airtight container. 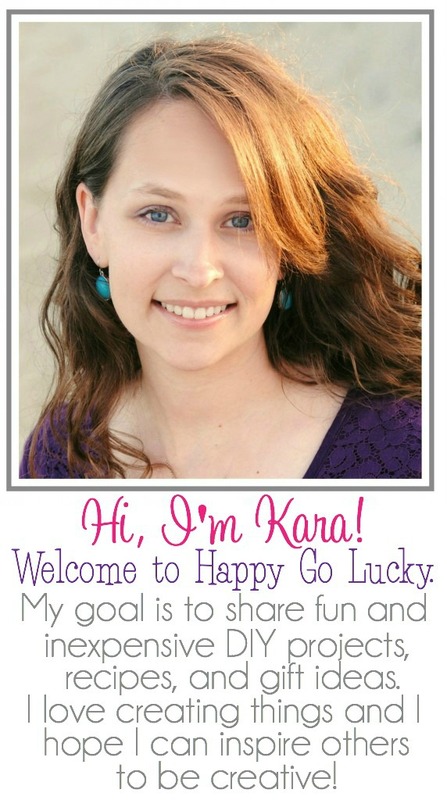 Previous Post: « Commit to Loving Yourself More!